Friday started off very promising for the bears, with a break below the significant support zone of 1285; however the bulls were able to get the market back above this zone before the close. As I wrote on Friday, everything that happens between 1285 and 1300/1310 is just noise at this point -- so we're still in a bit of limbo regarding short-term direction. The market has been sitting in the target reversal zone for what seems like forever, and I'm starting to feel like a broken record everyday with "either the top is in, or there's one more thrust higher still to come." Well, you'll be happy to hear that... nothing has changed yet. If I didn't have to actually update the charts (and didn't feel obligated to provide my readers with new info), I could just do a form-letter for the updates until the market actually reverses. That would save me a lot of time. Trade safe! Of course I'm only kidding. Sort of. Anyway, for today's new info, we're going to talk about the historical tendencies of this week. The market started closing for Martin Luther King, Jr. Day in 1998. Going back to 1998, this has historically been a pretty bad week for the markets, with the S&P 500 (SPX) ending the week negative 71% of the time for an average loss of 1.10%. The worst loss was 2010, when the SPX shed nearly 4.5% for the week. Couple that with the fact that January options expiration also tends to be negative -- the Dow Jones Industrials have suffered heavy losses on OpEx Friday in 10 of the prior 13 years -- and you have the makings of a week that favors the bears. 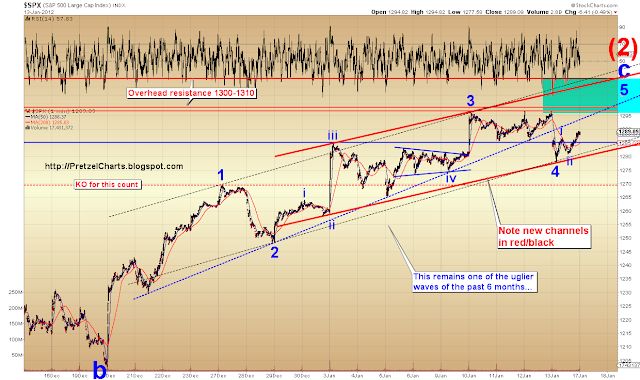 It is also likely that the bulls are running out of time on Minor Wave (2), if, of course, they haven't already. Friday may have finally marked the turn, but there's still enough play in this ugly, ugly wave that there may be another thrust higher left in it yet. It pays to remember that the absolute hardest thing to do when predicting the market is to call a turn before it happens, be that turn a bottom or a top. When you predict a turn, you are betting against the trend. And as they say, the trend is your friend... at least until the end, when it bends. The first chart we're going to look at is the intermediate chart of the SPX, which shows the long-ago-reached Wave (2) target box, which the market seems intent on sitting in until the cows come home to roost (or whatever that saying is). 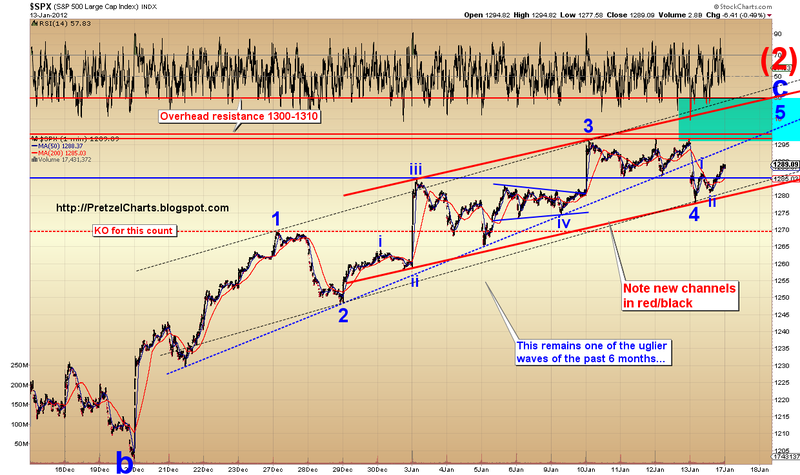 The expectation remains that once this wave reverses, the October lows will be broken. The next chart is the short-term SPX chart, with one possible count that suggests the market may have suffered a failed fifth wave on Thursday, in which case the top is in. I'm favoring this count, but only by a slight margin. Any significant downside follow-through on Tuesday would likely seal the deal; conversely, any upside beyond the recent swing highs would invalidate it. If this count is invalidated, consult the second chart below. We'll follow that chart immediately with my alternate count, which suggests wave 5 didn't fail, but actually started on Friday. The short term wave structure of this rally is maybe the ugliest I've seen in about 6 months, and has really kept me guessing. Remember the two week decline in December when every target zone I published was hit like clockwork? That was an ugly waveform too, but nothing like this rally. This current rally is the Ernest Borgnine of waveforms. Also note how the market bounced right where a perfect new trendchannel could form (in red). This is a very common occurrence, and it's one that veteran traders know to watch for. I strongly suggest drawing channel lines whenever two swing highs or lows allow it during the day, to help anticipate potential reversal levels. 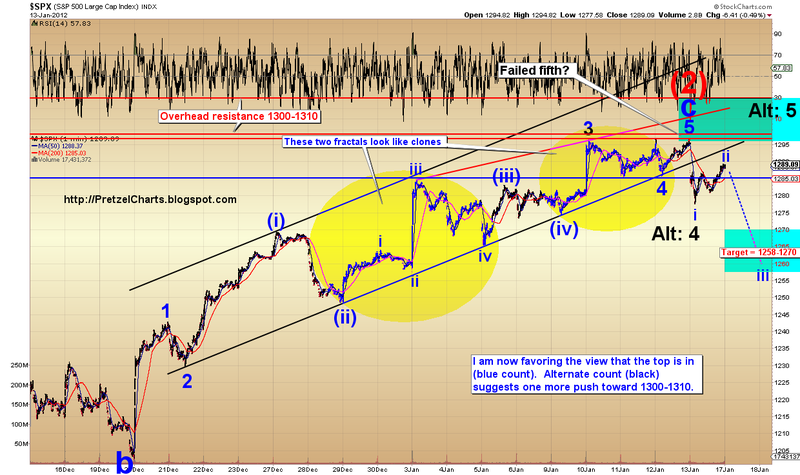 The target for wave 5 would still be the 1300-1310 zone under this count, though that could change with new input from the market. I still think it's unlikely the market will hold above that zone for more than a brief moment, if at all. The last chart is the updated US dollar chart. The correlation between the dollar and equities has uncoupled lately, but will almost certainly recouple at some point in the future. In any case, the dollar is the one market that hasn't let my predictions down even slightly since my first published dollar update on September 3, when I predicted that a major bull market was starting in the dollar. I'm updating this chart because the dollar corrected right into target zone suggested on January 9 and reversed higher -- and the waveform out of the reversal zone looks impulsive, meaning it seems very likely that the nested third wave-up is about to break higher in an explosive way. Since it seems to have completed five-waves up, a short-term correction is likely to occur first. After that, it strikes me as probable that even though equities have been ignoring the dollar, a big move like this may get some attention -- from the algo-bots, if nothing else. Note the blue melt-up channel. In conclusion, I continue to believe that a top in equities is at hand; and that the dollar is going to continue markedly higher. It's worth mentioning that I've had an excellent record at calling tops and bottoms, and hit both the October turns, and December turn, pretty darn well -- however, the market hasn't yet fulfilled my prediction that it will break the October lows. So I haven't been too terribly early when calling tops (nailed the October bottom, but major bottoms are easier), but I have been too early in projecting where those prior tops would ultimately end up. Sometimes it's hard to see ten steps down the road, and traders may want to remember that although Elliott Wave allows us to make these predictions, often with a high degree of accuracy, there are always multiple paths the market can take to reach conclusion. The lesson I hope to convey with this is that traders who protect their profits can do very well just hitting the turns, even if the market doesn't go down that road as far as one hopes it will every single time. Trade safe. Didn't expect to see an analysis today, shouldn't you be taking some time off and sleepeing? Hey? I thought there was only one person int he world who was allowed to look or mention the dollar and I am not referring to me. lol Thought it was proprietary. Damn, I can't get away with nothin'! Yes, fine it was all your idea, I admit it. I probably wouldn't have eaten at all without that suggestion. Hmm... actually, that makes the stomach bug I got *all your fault*! Thanks a million! I assumed ES to go down as up against TL but it has jumped TL. Head fake or break out. Scanning thru my symbols I am finding NO small cap stocks pointing to the upside and a number of oil stocks pointing up. Does this mean that Iran thing will now heat up,, i.e. oil up, gold up, and mrkt down? PL, thanks for taking the time for an update today - and enjoy your "day off"! Moodys suggested their AAA rating for France might also be in jeopardy and S&P said they believe "Greece will default shortly". Yet, Europe up 1%. The French bond auction went well, but it was all very short term paper covered by the LTRO - France has some 10 year paper to sell on Thursday I hear. ES hit 1292.25, nice call katz. Added back a couple contracts @ 1292 that I covered earlier. Futes closed at 11:30 EST. Thnx B O B. Appears we are very overbought now. hmm, i'm on the cme site and can't find a clean explanation of the hours...i'm assuming these are special hours due to the holiday...do you know when they reopen and where the hours are posted? thanks katzo. It was MY recent idea, as you WELL know, P-head, that dollar index was about to breakout BIGtime, when 81.5 level is taken, due to 3year TA chart study, no ew at all. You hadn´t even updated your dollar chart for over 2 months, until I mentioned a week ago, and now once again, last friday. But it's ok, we BOTH know it, despite your repeated negligence in admitting it. No problema, plagiarism is the greatest form of flattery. Lol, S&P got around to downgrading the EFSF one notch. Clearly this is priced into markets. :) But actually, since they are ditching this and accelerating the ESM coming online, this may not actually affect the markets much in the short term. It'll take some serious bank failures or CDS triggering or something else 'unforeseen' to do that. Now, C and WFC earnings misses tomorrow, on the other hand, could put some pressure on the market immediately. I suspect they'll miss, since the cream of the crop, JPM, missed already. "This current rally is the Ernest Borgnine of waveforms." That's just plain mean. I blew milk out my nose, but mean. LOL! PL; thanks for the MLKD update! Quite unexpected. Question; What is a failed wave? I didn't know waves could fail, and what are the implications? 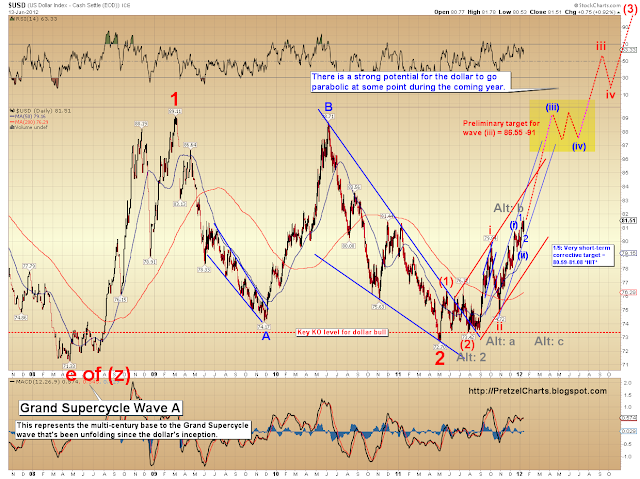 A retry of that wave -in this case 5th- or will the wave cycle now continue? Hey guys I have a question re counting waves: Some people (like katzo7) count waves taking into account all trading hours (ES) while others (like PL) in their charts show only RTH prices and waves. How do you reconciliate this? And which is the most widely accepted view? I mean, whats if a major wave top/bottom occurs sometime overnight? Should we depict it on our wave count chart or not? Thanks in advance! I’m the NEWBIE around these parts. I’ve been watching for a couple of weeks now. I appreciate all of the teams good work. P.L. I wish I had your knowledge, I know I share your taste in music. "Any Major Dude Will Tell You"
I believe that a "failed" wave is a truncated wave, which means that the top of an impulse wave (in this case wave 5) does not exceed the top of the previous impulse wave (wave 3), as it would normally do. 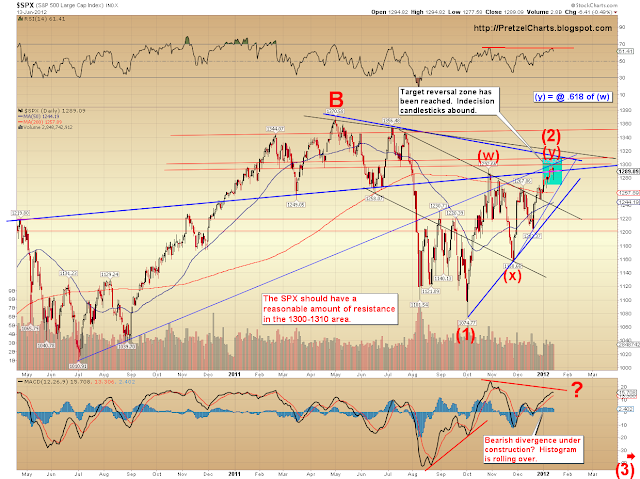 A truncated wave implies a tired market and could potentially be succeeded by a more powerful correction than usual. Please correct me if I'm mistaken! Please see my reply above. I forgot to mention that the implication is that the wave cycle continues. Why this jerk allow to post. Seem like all he do is give insults. FYI, equity futures reopen at 6pm EST today. anybody recall what the ES high was on thursday? 1294...1296? Giving back to the blog, here's some work that I watch concerning the equity options put/call ratio. As you can see, we are in the zone for some action. Billy...Anon just has a direct style of expression. Glad to have him here. He was just reiterating his thoughts on the matter. And... he just pressed your buttons without too much effort. Just think of it as being at Thanksgiving dinner with your whole extended family. Always a surprise. Welcome Mrjig. We all will flourish under Mr. Pretzel's umbrella in an educational environment. Feel free to ask questions to anyone at any point. This should be a two-way street. No, you are correct, I do not think I would venture to say that the correction could be more powerful tho, it is what it is. Could go straight down or turn into an ABC, an ABC is a continuation of the original direction with a bothersome pause. All EW3s have a minor fractal of a full EW5 within them so it would revert to that count meaning that the minor wave count turns into the major one thus finalizing the move. Basically an ABC move in this case is a move that no one can figure out. Sometimes the A = C. Sometimes not. Here is some explanation about EWs and where were are. No firm conclusion yet. Me? I think a good down is next but will readjust to any mrkt condition. EWs are criticized with: 1) everyone having a different count or alternative count; 2) being subjective; 3) recounting all the time. There was a firm that decided to take #3 on and be firm with their EW count, not to ever recount, selling sofware that delivered such. THIS FIRM WENT BANKRUPT. In my work I am looking to recount ASAP. I need to know what is projected ahead ASAP. You saw this today; thought the TL would hold and we would go down, other indicators pointed to this. Saw it jump the TL, ke=new something was up, then put a pretty accurate tgt on the close. See my 3 ways it can go? I think door #3. But I will adjust to any mrkt condition. Above the blue EW5 and this chart is history. Bad history. WHy do I chart EWs on ES? Because I play ES. Hello to asjones and akwfung. Just want to say thanks for the feedback regarding the tax question on PL's last thread. This blog is a wealth of information and it is much appreciated. 1) I had started to develop a similar strategy for my RothIRA but my ego got the better of me (see PL's last post, http://pretzelcharts.blogspot.com/2012/01/spx-update-11-year-study-of-investor.html for an intriguing deep-dive into the concept of ego and how trying to save one's own life will inevitably cause one to lose it...to paraphrase a great man. If the 3 wave down materialize's the way we hope/think it will, I will have escaped a trap and learned a very valuable lesson. 2) Is your screen name a play on "Aqua-lung" the Jethro-Tull version or the scuba diving equipment or neither? It may or may not happen but be aware that they are setting up to push the ES to 1298 at this moment. If they can push it through 1292 then the only line of defense for the short term bear is 1294. Great chart and a great explanation! Thanks, Katz. and to Peter N. for his donation. Yet again, congratulations on another excellent post. As I've stated before, the vast amount of value you offer your readers is just extraordinary. Being an employee of Scandinavian investment bank, I can acknowledge that your material is absolutely comparable to the best in the industry. Keep it up. I wish you all the best and great succes in the future. The market has already priced in a two notches downgrade for France. So Friday's one notch was a pleasant surprise. The Greek PM swore that his country will not default. The market has already priced in a default scenario of a 60% haircut. It is not clear the extend of damages due to CDS. Many think that it will not be significant. So the ECB's de facto QE and bond buying did buy the sovereigns time. It kick the proverbial can down the road - until the march time frame. When they will have to roll over a ginormous amount. The wildcard is perhaps Hungary - the drama has yet to play out.. I just discovered your blog and its really excellent. Thanks for your time and generosity in sharing your insights. I have a general question: It seems that the market in Q4'11 was 'saved' in the short term by the Fed Swap and LTRO from a liquidity event. On ZH, there's a rumor that the 2nd LTRO (due late Feb) will be massive. In your experience, how do these things (massive CB intervention) impact the analysis (EW wave counts, etc). Perhaps something similiar happened in 2010 where QE arrested what was to be a natural crash. Do the rules still apply? jacko, damn good chart, but, do note, usually there is a doubledip in it, before the serious kill breakdown. So yes, good time to short or get puts, but, there could be a fake temp dip, and then, another retest of h&s neckline, to further spook hell out of the last bear, before evil nasty kill collapse. Look at chart doubledips. yeah, I was just looking at that possibility when your post posted. you think? ammazing, didnt know u bakkwoodd folkk could thunkk. So we're to look for the downward pointing pair of ears that resemble a sleeping bat? Certain CB actions could effectively "kick the can" again. The problem is, just like the housing market, the more times the can is kicked, the worse it gets in the long run. It would be another band-aid on a terminal patient. So things can be delayed, but not ignored. This could mean that one should be extremely careful if playing with long options. 99% of the time, the cash market reconciles itself. Very very occasionally, a wave may complete in the futures. Personally, I don't like using EWT on futures, because the leverage tends to distort the counts and create overlap and rule violations. Just my personal preference. ty for answering this PD and kat. I'm having the same issue. The background is black and the text is normally white, however for the last hour or so the comments text is showing up black so it is invisible and I have to highlight the page to view the comments. The article text is still white and visible. This is with IE, haven't tried other browsers on my PC, though everything is fine on my Android tablet using Opera mobile browser. Yep, having the same problem too. So much for a day off. Working on it. Hit ctrl A to see comments in the meantime (course, you can't see this). I can't see the comments either without hitting Ctrl-A. Tried both IE and FireFox. You guys can see it now, right? I temporarily changed the blog background color. MRJ: hope you survive to trade another day. This is a great place to learn what you did wrong, but don't feel ashamed for making mistakes. It feels like that's just "paying your dues". ugh, 1298 futures...maybe it's get's knocked back down before cash trading but I'm fearing wave 5 right now. C and WFC would need to miss very badly for an impact to the market... JPM missed, but their stock was hardly hit. I'd love to see a big drop, but it would take something really big. Door #1 opened (from chart below) pushing past 1292.25 ES. Looks like tgt is 1312. Looks like wave 5 it is... One more push to crush the last bears. Got stopped out of the majority of my shorts at 1292.75. Put a few back on just now at 1300.25. Gonna sit tight from here and just watch and wait for a bit. Definitely a 5 with the steepness of that incline. On a brighter note, I did get the post section working properly again. Hoorah. I have no clue why it stopped working in the first place. Might have been a server glitch. Disgust [sic] does that. Sometimes too many users on the total system does weird things. Servers cannot handle it. hammer. Also there is a Bollinger Band breakout. GLD just spiked, EW4 tgt 162-5 on the 120 chart. I think Brianhut put it best in an email he sent to me last week, "I think this market top is one of the greatest mind f*cks we'll ever see in the next couple years." Possible H&S on the 15, building now, or just before or around the opening. Limit on up about 00.75 ES area, would like to see it hold even a bit lower. Bloonberg: "Eurozone regulators' short selling ban on banks and other financial companies was today extended to include a ban on all market tops. In a statement issued today, the European Market Oversight Committee said "While financial markets were volatile over recent months, investors are now rapidly moving toward a consensus that the troubled period lies behind us. As regulators, it is our duty to respond to these changed circumstances, and we expect our actions today, prohibiting potentially disruptive market tops, will serve to further reassure investors". It is understood the ban is subject to continual review, with EMOC spokesperson Per Lumpa adding only that the restrictions would be lifted "when market conditions allowed". So new rule extends to the US mrkts and shorts can only be established below SPX 666? Sounds like they could be preparing for a major event that may bring down the market, and are marketing it to be safe to be long. Goodmorning all! Let's all put our hopes to the 1310 resistance line and hope it holds! Any predictions? How many days could it take for EW5 to unfold? 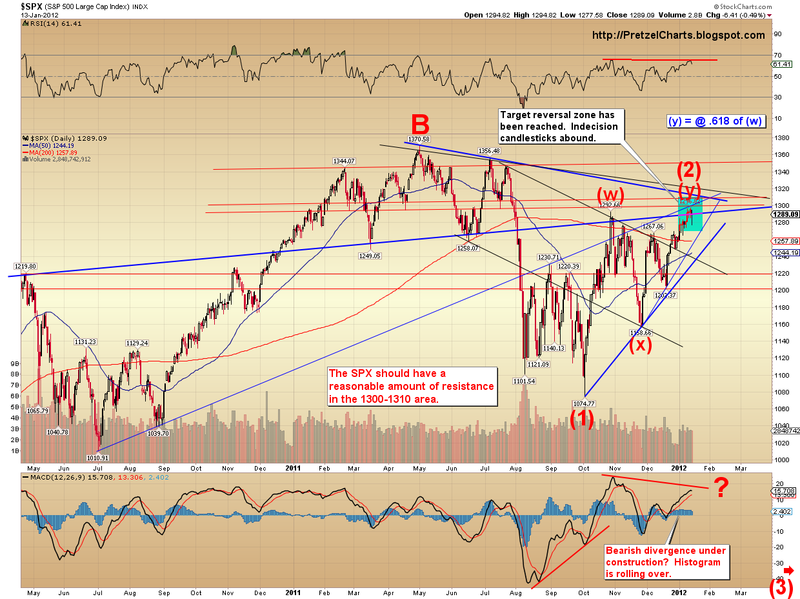 Or do we still expect strong resistance at approx. the current levels and a correction to follow? Nah, even though I spent most of the night studying charts, I really have no new opinion since the update -- except it looks like the market may invalidate the failed fifth count right off the open. Hi PL, great update as always,have been scanning the blog for your latest updates regarding gold,silver, copper, euro, dollar and oil. Well the dollar you gave us an update of today, many thanks, and an update of the euro a couple of weeks ago.Are the below mentioned links your latest or have I missed any? If you have any updates, any chance you can attach your latest charts, (explanation/comments not necessary, im would just like to compare your latest charts with reality and with my feeble knowledge in EW make my own calculations).# http://pretzelcharts.blogspot.com/2011/11/quick-crude-oil-update-top-in-sight.html# http://pretzelcharts.blogspot.com/2011/10/dollar-verging-on-huge-rally-gold.html# http://www.livecharts.co.uk/MarketCharts/copper.php# http://pretzelcharts.blogspot.com/2011/11/quick-silver-update-thats-quick-silver.htmlKeep up the excellent work! Shorts are all over the Euro pre-market. It's hard to say at this point whether the market will pull back a little bit or not at this moment but the move down to 1291.25 potentially is there. It'll be at 29000...crash is "priced in"
Am I correct in assuming this is the place to be for Tuesday's action (i.e. no new post today)? I believe credit scores go above 800...I know mine is. We are now on 4th down. Last Friday's 3rd continued with this morning's gap up. No? Entirely possible. Last 2 spike rallies haven't really turned into 5 wave forms... wondering if this will be th same deal. back in 2/3 short, 1300 looking pretty solid. tight stop. Pretzel, I'm not in the position to short right now, but I think AGP may be doing a headfake breakout out of a rising wedge that retraces about 85% on a corrective wave. What do you think? $BKX and $TSX leading the way down today? so you're not thinking today's the day? Whoever is interested in an AZO short, check it out. Those future guys/gals are crazy. They don't eat. They don't sleep. On the 1 minute charts for any index does the gap up count as wave 1 of an impulsive move or should it be taken in context with the prior days action? Just lookin for any thoughts. I mainly trade the RUT and NDX. Thanks for any help from the board. Euroland is now closed. It's a sea of green. Bizarro world...just think like a criminal...need to get retail to throw it up a few points and then they can be taken down. Even with the "good news" and gap up, volume across the board is pathetic. Not many believers at these levels. guys, look at the 15, 60, 120, 240, see those dojis? signifies the conclusion of at least a ST run up. Just too many, 3 on the 120 & 15.
there we go, short ES would have been at the doji level (~1300). Everybody knows that the Fed has been running the futures up overnight. Price is truth - low volume or not. Some analyst in Bloomberg said that the sucker could have a low volume melt up to 1350. Watch out. think algo sell program set at 93.75 but cannot tell of it is a sell or a buy. Thanks for the input. I will see if I can post a chart. Hey Bill, did you say you bought this programmable bot trading system? Can't remember the name. I don't have unlimited $ to fight the tape. So I have to be agnostic and listen to the market - do whatever it is telling me. It is "truth" in that sense. My job is to protect my liquidity, not to prove market right or wrong. Could we have seen the top? Maybe PLs alt count in play? I whole heartedly agree with you on following the tape. I bought MultiCharts. It allows you to trade by clicking on the chart at points of preference, and also automatically by coding a program that represents your strategy. I haven't touched it much yet. The thought of automatic trading is both exciting and scary at the same time. It's at http://www.multicharts.com/ . I got it on Blackfriday for 50% off for the life time license. Else, it's about $1,000. After screen capture, you need to save to a file. Then on PL's blog page, with comments showing, type in the post, then click the "+" icon. You just select the file and it will do the rest. I was wondering what led you to choose this particular tool, 50% discount aside? Why not Ninja, for example? It's got a programming system also. Thanks for the help. I do appreciate it. Most of the decent trading platform have programmable functions. I use thinkorswim with TDA. It works great and can trade any type of instrument. Down side is that it does not chart EW like Katz’s eSignal (but it’s free, so what can you expect!). Btw, Jing is a nice screen capture and annotation tool. It's free. It's interesting that the SPX is moving up, yet the VIX call options are not going down in price. They usually should be inverse of each other. The values are holding, not moving up; but normally would expect them to go down in this scenario. Looks like ES 1295 is putting up some resistance. Matching what you see? It was a combination of things. A friend of mine was/is working with someone that used to be in the markets big time. That guy hired my friend to code for him with this program. I figured it would be a good opportunity for me to learn as well. Also, I was going to go with Interactive Brokers; and it seems like IB works closely with Multicharts for their API to match with each other's systems. I have not checked out Ninja that much. 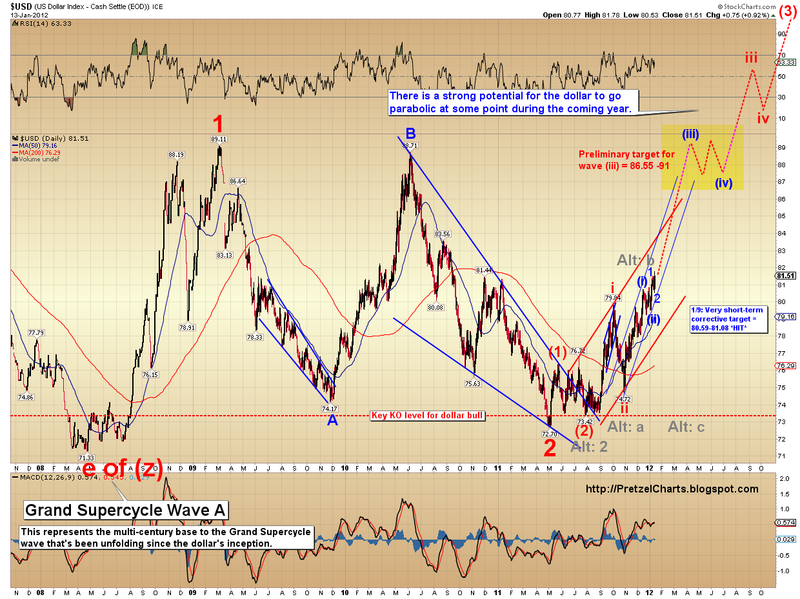 Gold just rejected the 61.8 retracement of the corrective wave off of it's latest impulse down. Thanks. I bought this timing indicators system and it works best on Ninja, so I'm tending that way. But I thought I would ask around first. You can, but my attachments are large enough to do full program trading. I set up fairly complex conditional trades with no problem though. You can go 8 deep on conditional orders. People are still running to US 10-year. Yield is stuck at 1.8+/-%. BTW, I give all the credit to ANON20 that he deserves for the play. you seeing that as the completion of a wave 4 or something larger? Yes, quite a lot of online info. Webinars (including archived webinars), and decent help files. What do you mean by "attachments?" yeah, same problem for me...its the backwardation of the short term vix futures...tvix and vxx bleed in that scenario. I think I'm going to stop using these instruments. It's hard enough to get direction right much less the effect of time on these derivatives. guys, providing some strong hints here, get it??? Sorry but this is getting old! Anything related to VIX is very risky. If the market is "normal", playing the vix is awesome with using time-decay on your side. For markets like this, if you try to time the market for a drop while using the VIX, it could cause some serious hurt (1st hand experience :( ).